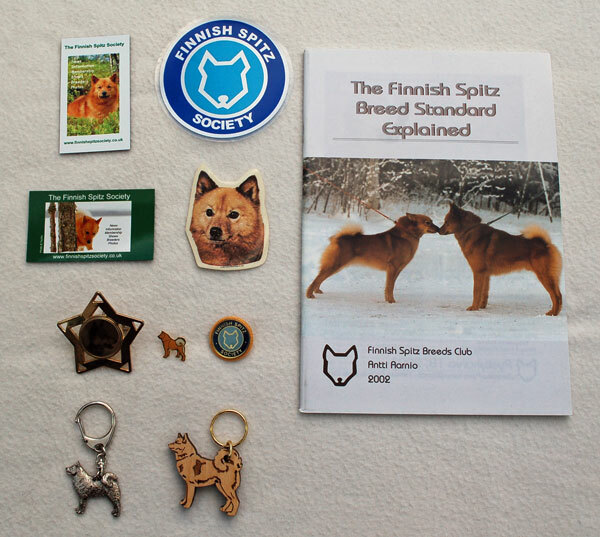 Welcome to the web shop of The Finnish Spitz Society. 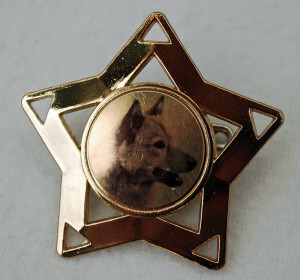 We have a small selection of Finnish Spitz items for sale. We hope to add a few other items, so please check this page again soon. To view all of the items in our shop, continue scrolling down this page. To view certain types of product or all products from a particular manufacturer, click on any of the buttons below. These are the most recent additions to the range of products in our shop. These products have sold out or are not normally stocked but we can get them for you by special order. 4 different types – metal (sold out), birch, curly birch, or yew wood. 5 different types – flexible, birch, curly birch, yew wood, or wooden peg. 1 FS head sticker, 2 car window stickers. FSS badge, FS pin badge, FS ring clip. 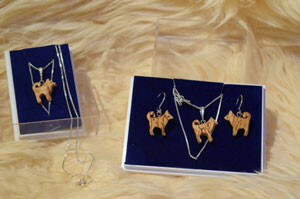 Earrings and necklaces in curly birch with silver pin/chain or rubber chain. 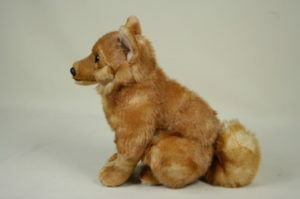 Finnish Spitz soft toy designed in Finland by Vivantti . Now back in stock but selling fast! 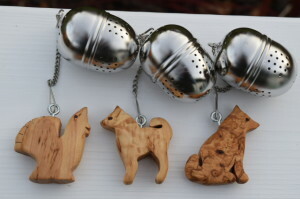 Made in Scotland by Magic Thistle Crafts – yew key rings, fridge magnets (yew and peg), yew hanging decorations, and wooden bookmark. 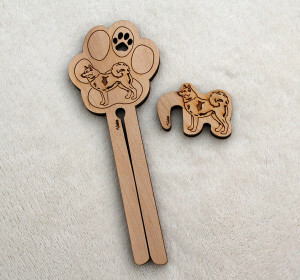 Made in Central Finland by Veico – key ring, FS-shaped wall hanging, clock, pot stand, kitchen set. 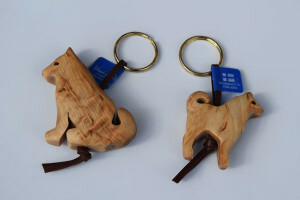 Made in Northern Finland by Wood Jewel – key rings, fridge magnets, bottle corks, and necklace. FS Breed Standard book, FSS Calendar. Postage Stamps & First Day Covers – coming soon! 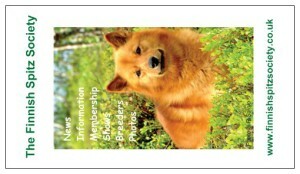 Badge, car window sticker, flexible fridge magnets, calendar – all produced by or for The Finnish Spitz Society. For further information about ordering including details of current availability, special order items*, and postage charges please click the button immediately below or the button alongside any item listed. In the listings below all prices are in Pounds Sterling (“GBP”) and EXCLUDE postage and packing costs. Photos of individual items are NOT to scale, but weights and dimensions are mentioned and you can get an idea of relative sizes from the 2 photographs of the various items grouped together. These are at the top and bottom of this page and on the Shop Ordering Information page. - Standing dog - 4 x 8 x 3 cm, weighs 15 grams. - Sitting dog - 4 x 10 x 3 cm, weighs 22 grams. Each item is unique with different patterns and slight size and weight variations. - Standing dog - 4 x 4.5 x 1.5 cm, weighs 9 grams. - Sitting dog - 5 x 5 x 2 cm, weighs 17 grams. 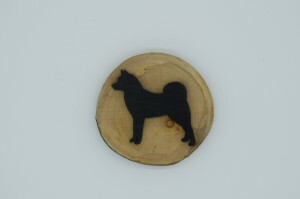 - Standing dog - 4 x 4.5 x 1.5 cm, weighs 6 grams. - Sitting dog - 5 x 7 x 1.5 cm, weighs 14 grams. Each style is available in left-facing and right-facing versions, so altogether there are 4 different looking magnets. In reality though there are even more as each item is unique with different patterns and slight size and weight variations. 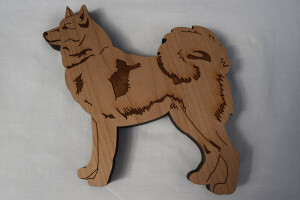 This is cut in the shape of a Finnish Spitz with the image of one burned into the wood. It is designed and made by Veico in Finland out of local birch wood. The size is 17 x 15 x 1.5 cm and it weighs 105 grams. It is like a much larger, thicker, and heavier version of the key ring (without the metal ring). 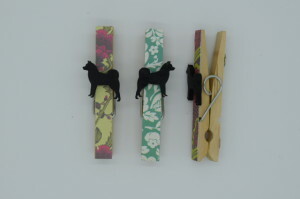 It can be hung on the wall as a decoration using the hole on the back or by attaching a small hook. It will also stand freely on a firm level surface although it may need some form of support if you intend to do that permanently. This item was made specially for the FSS and is not sold in this form by the manufacturer (they market it for a higher price as a sauna thermometer with temperature markings and a dial). 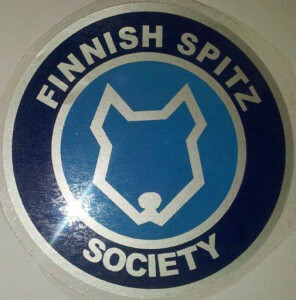 A flexible vinyl fridge magnet produced by the Finnish Spitz Society (in landscape layout) with our new logo designed for us by Alexia Achilleos. Size 9 x 5 cm. Weight 6 grams. 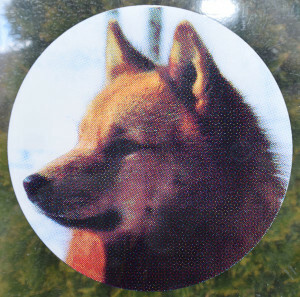 A flexible vinyl fridge magnet produced by the Finnish Spitz Society (in portrait layout). Size 9 x 5 cm. Weight 6 grams. 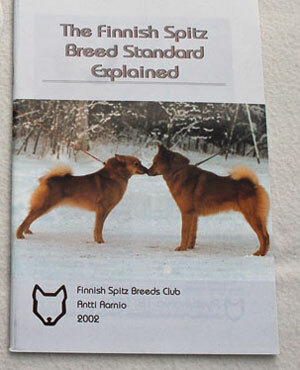 "The Finnish Spitz Breed Standard Explained" book. Published in Finland by the SPJ (Spitz Breeds Club of Finland). Written by Mr Antti Aarnio (former Chairman of SPJ) and translated from Finnish by Angela Cavill. Paperback, 60 pages. "The object of the book is to help the reader develop a clear picture of what the Finnish Spitz is and what it should be. 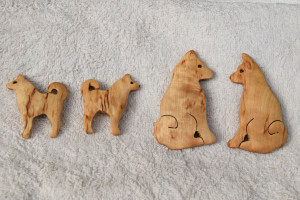 The primary intention of these notes and explanations developed from the Finnish Spitz breed standard, is to introduce new judges as well as those experienced in judging other breeds, to Finland's national breed. The writer hopes that they will also be useful to breeders, exhibitors and owners who wish to understand the finer points of this breed." Contains many colour photographs and a number of historic black and white photographs and illustrations. Size 17.5 x 25 cm. Weight 172 grams. 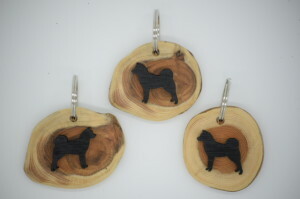 Hand-made in Scotland by Magic Thistle Crafts from highly polished and smooth yew wood with a large black outline of a Finnish Spitz attached. A tartan ribbon (available in red/green/white OR green/blue/black) is attached to hang the decoration. Weighs around 30 grams and measures approx. 8.5 (h) x 8 (w) x 1 (d) cm. although weights and dimensions do vary. 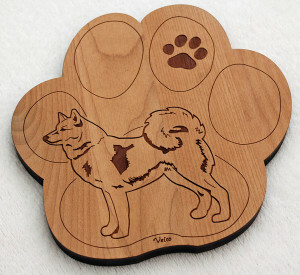 Hand-made in Scotland by Magic Thistle Crafts from highly polished and smooth yew wood with a large-sized black outline of a Finnish Spitz attached. The reverse side has a large magnet strip attached. Weighs around 30 grams and measures approx. 7 (h) x 8 (w) x 1 (d) cm although weights and dimensions do vary. 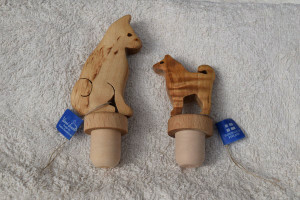 Hand-made in Scotland by Magic Thistle Crafts from highly polished and smooth yew wood with a small-sized black outline of a Finnish Spitz attached. A silver-coloured ring is attached close to the top. Weighs around 12-15 grams and measures approx. 6 (h) x 6 (w) x 1 (d) cm although weights, shapes, and dimensions do vary. 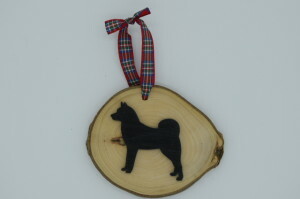 Made in Scotland by Magic Thistle Crafts from wood with a small-sized black outline of a Finnish Spitz attached. 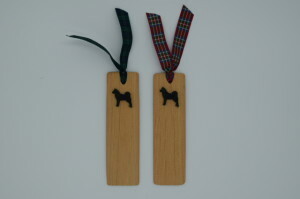 A tartan ribbon (available in red/black/white OR green/blue/black is attached. Weighs around 8 grams and measures 14 (h) x 4 (w) x 0.2 (d) cm. Made from treated wood veneer in a heart-shape. Available in a choice of blue-grey or natural colours. 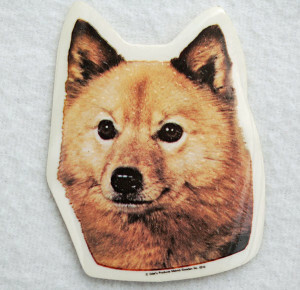 One side has a recessed image of a Finnish Spitz in orange-brown colour. 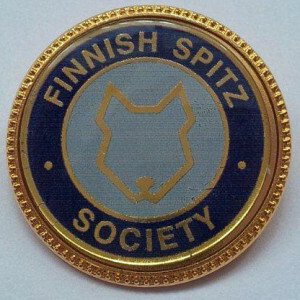 The reverse has the words "Finnish Spitz". A silver-coloured ring is attached. Weighs 7 grams and measures 4 (h) x 5 (w) x 0.3 (d) cm. - a set of 2 earrings (silver pin) and 1 necklace (silver chain) in a plastic jewel box for £25.00. * SOLD OUT * - please enquire about special orders for this item. - a pair of earrings (same as in the set) in a plastic jewel box for £13.00 * SOLD OUT * - please enquire about special orders for this item. This Finnish Spitz soft toy has been our most popular product - so much so that we completely sold out of them in October 2017, as did the Finnish company Vivantti who design and supply them. After several months with no stock, we have now got a new supply …. but they are selling fast! This is a decorative wall plate made by "Arabia", the famous Finnish pottery company. 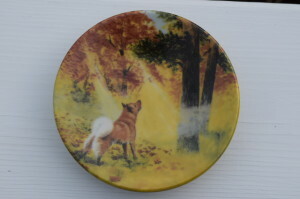 It features an image of a Finnish Spitz in typical pose in the forest - stood at the base of a tree and barking at a bird higher up on a branch. Please note that this is the smaller version of the plate (approx. 12 cm. in diameter). The larger plate with the same image has been unavailable for a number of years. 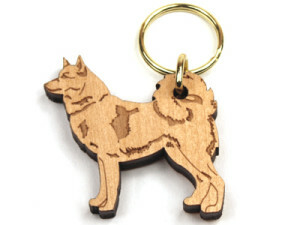 The Finnish Spitz key ring is made in Finland by Veico out of local birch wood. The size of the keyring is roughly 5 x 5 x 1 cm and they weigh 8 grams. 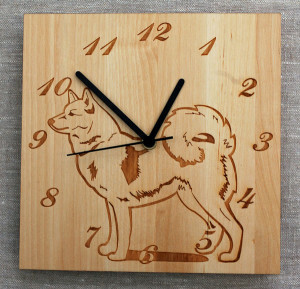 The wood is cut in the shape of a Finnish Spitz with an image of one burned into it. 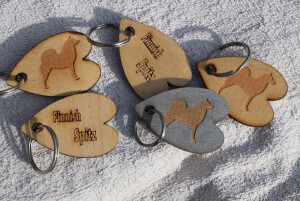 Each keyring costs £4 before postage and packing costs. These keyrings are made in the UK out of silver finish metal. 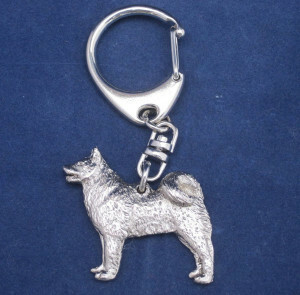 The size of the keyring is roughly 4 cm x 3 cm and it weighs approximately 18 grams. We are selling the keyrings for £4.00 each (manufacturer’s retail price £6.25) before postage and packing costs. 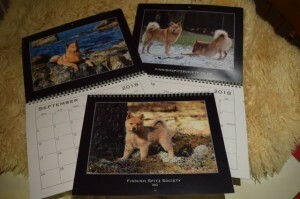 The Finnish Spitz Society produced this calendar for 2018 which is packed with photos contributed by our Members. 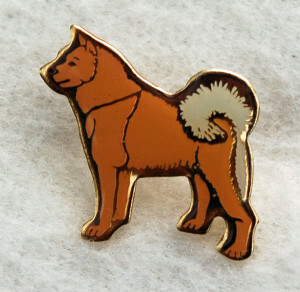 The price for Members of the Finnish Spitz Society is £8.00 plus postage and for non-Members is £10.00 plus postage. * SOLD OUT * Remember to order your 2018 Calendar early! It will be available in time for our Open Show on 27/10/18.